When I look back to recall old memories of trips, motor biking etc....I always feel that I never went anywhere as a trekker. I used to tell myself that how to get more other than it. 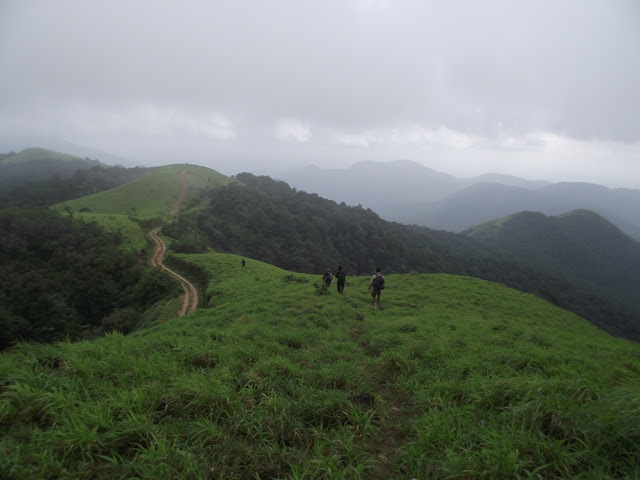 The word Trekking which had been emerging from those days was adding fuel to my desires of getting into forest areas. 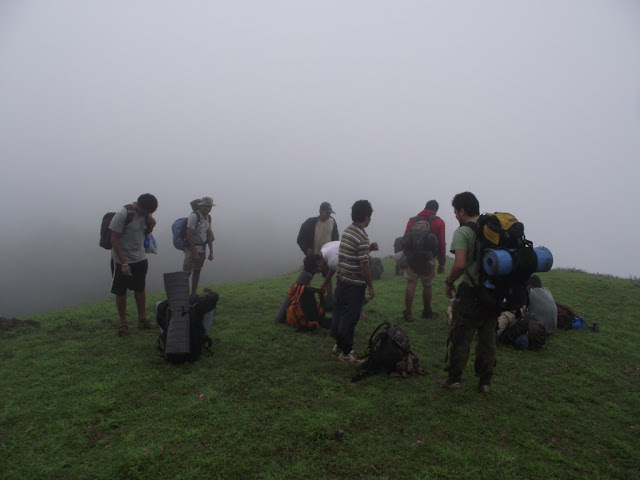 I was searching to pick a trek that will be through a trekking club so that I can be with professionals. Picked Ettina Bhuja to Ombattu Gudda (EB2OG) route since the route has many benefits like peace, type of location that is detached from civilization that too without even a tea stall. The list will go on... Resulting in a mini village… have seen the examples in Coorg in a span of ten years of regular visits. Within ten days after EB2OG/2, I asked Mudassar Khan of BASC about doing EB2OG/3. He replied "wait for some more weeks till monsoon fade away.." I couldn't resist. Pleaded Mudassar a lot.. aahh!! Did he say Thathaaastu?? Granted full freedom, full access to whatever I do!! Woww.w…. No one is stopping me.. What’s happening here… dear mud... Can u be my boss in future?? While everything was going well & things went as usual. To my surprise, no one from EB2OG/2 responded for EB2OG/3 trek except NCC medalist, who was pushing me to postpone.. My priority was to push the selected EB2OG/2 guys at the top of the short listing process. Well…monsoon will fade away very soon. NCC Dude.. I promise you that we ll go again that too personally…this time got enough guys in the team with similar interests. The remaining guys Ufff… look like jobless youths dying to do anything... Oh.. what a time I’m having.. Shall I request for new guys with enough experience…no time... Remember the first trek with mud..do some magic.. go..go.. Missed calls turned to several SMSing… The word “BASC” in the first few lines united new guys one by one in Majestic bus-stand. At the same time I realized that some of them were those who were sneaking to check whether it is the same team, a few minutes ago!! Few meters away in the same bus stand, another group from BASC was also waiting for the bus to go trekking in different locations. Informed EB2OG/3 team that I will be back in 10-15 minutes to meet that group. Knew some faces in that group, did some handshakes, had little chat, exchanged wishes. At the same time i turned at a guy. Wore a smile, did a formal handshake. He was wishing with precaution words and lectured on how to take care of myself... Stop it!! You idiot… It would be better if u were in our team and then supporting the team well... Anyways enjoy yours!! Reached our team, told everyone “looks like the bus may come late, better if we go by walk the entire night”. Suddenly smile appeared on every faces. The bus arrived at last. I Requested bus-driver, to drive the bus in the way that we can reach Mudigere as soon as possible. He smiled before starting the engine… Didn’t like to guess the meaning behind the smile. Just went back to my seat, closed my eyes. i was half asleep-half awake during the entire journey. In a moment someone woke me up. I was about to shout “Momm… please allow me to sleep more”. Suddenly realized the situation, conductor of the bus was with red eyes with a wicked smile to inform us that Mudigere town has arrived!! Got down from the bus, unloaded the backpacks from luggage box of the bus. Went inside Mudigere bus stand to have our morning rituals. I was surrounded by participants every minute to clear their doubts. At the same time we got the assurance from sumo driver through a call. Ordered Idli-chatni in the nearby hotel. We gathered in front of the hotel waiting for parcel and tata sumo. It took nearly 30 minutes to get the parcel. Used the chance to introduce ourself in informal ways. One guy had done many north India trips that too with motorbike. This trek was kind of new to him but i was sure he can do it. His topic was enough to kill the time!! When we were loading parcel into our bags tata sumo arrived. Everyone sat inside with comfort. On the way the driver got confused in finding the route to reach our starting point by going in a direction for nearly 5-6km. Thought of warning driver. But kept myself silent to keep the time for imagining how to do, what to do. Finally he was able to take us to the original starting point. When we got down, had a formal chat with sumo driver, thanked him for bringing us at the right time. Checked whether everyone ready for the trekking. Started from the back side of the temple. Didn’t go for exploring the new trail like how I tried in EB2OG2. Went on the trail made by human and cattle. Reached a small stream. It was still roaring. Few ups.. Some more ups.. No sign of EB peak. Was wondering has the time/situation gone bad. It was fully covered with mist, clouds. In previous EB2OG2 we barely managed to see the peak from the same location. This time…. Is this a warning or Is it the time for our mother earth to reach it’s height during Monsoon time. EB should have shown its beauty from these points(2-3km distance).. But 'mist' was blocking all.. Started climbing the steepest part of EB. We climbed some big and uneven rocks and reached the top of the terrain.. No sign of peak’s visibility. Mist was slapping harder. Difficult to guess whether it was raining or was it coz of wind+mist... when i informed the team that "This is Ettina Bhuja peak". No one were in the state to believe it since the visibility was so poor to identify the shape of ox's hump...Everyone were trying to click their camera from safe location to avoid more damage. For me it was not even worthy. If we try to click from a distance to put everyone in a photo, mist was in our way. Hardly spend 10-15 minutes in the peak, we prepared to get down. Tiny pink, light blue and yellow colored flowers were blooming all the way… Was feeling kind of happy with the scenarios. 70-80 degree steep climb appeared in the forest. This time it was more slippery. For participants, The muddy stretch where climbing up was a challenge. Finally everyone managed to overcome that trial. Reached unused jeep trail, filled water bottles with pure water. When participants were doing the same, I looked up to see the sky. It was covered with tree tops with sunrays piercing through them to reach the earth... Inner peace once again…!! Grassland appeared. This time more and more mist in that area. Was really surprised to see what happened to our mother earth. This time was supposed to be minimal when compared to previous month. I was telling myself to always be careful, you can do this time, you don’t have any issues this time so u are free to do whatever u want, just move carefully without stopping your head. Within a couple of minutes I tried to get down from that location which was different than what I did in EB2OG2. The same mist was trying to mislead us. It was challenging task to find the right direction. The compass was showing proper direction. But the terrain was kind of flip-flopping. We blindly walked in a direction. To my luck & updates from fellow participants, none didn’t slip off. At the same time I was praying God to blow the mist for a while to see what’s in the front. God seems to be trying to help us. The strong wind was fighting with heavy mist to allow us to see the real path. In a moment a very strong wind washed the mist away just for 20-30 seconds. GOT THE CLEAR VIEW... Suddenly I noted down all the possible ways. Thanks God, he saved us before we go in the wrong direction. A main hurdle cleared...My heart was pounding at a fast pace when I looked at the time. I heard that shoulder level grass was making our move even more tougher..Finally we covered that grassland which is next to EB which is also near to a village. There was much Less mist was in that area. Stopped for a moment, shared snacks/chips with each other before encountering another grassland which was misty. Short break before entering another grassland at or around 11.30am..
That grassland, those moments were pretty challenging, more mist, more wind… I was really enjoying the moment. That was one of the best moment with a fresh mind and a happy heart. we were Blindly walking all the way. it was Difficult to see each others with a distance of 20-30 meters. i Was shouting at participants to give a hint of my present location. After a few hours I was informed that some participants lost themselves in the mist,only my shouting was helping them to realize their path!! Finally found the used jeep track which goes toward a coffee estate which also leads us to OG. Once again I smiled for a moment after looking at the time. Participants halted on the OG road to have lunch.they wanted a Heavy lunch .i Realized how they were suffering after that long walk. At the same time I looked at the path which we covered before. It was astonishing to see that EB was still covered with mist, clouds!! That too in the afternoon at or around 2.30pm. A salute to mother earth for its rules. Reached the diversion which goes toward OG peak from the Estate road. The Sun was shining at its best. Finally reached the top. Had a photo session. As per the plan I changed the route from the OG peak toward Gundya which was really new to me since I reviewed those areas through map, printed maps, compass etc.. While getting down towards Gundya, suddenly I looked back at the peak and told myself “Bye bye OG.. Going to miss you...”. Within a second was in shock state, wondering why did I think like that.. till now we are not allowed to step our foot in that area. Getting down in very slippery grassland. I was in the front. Didn’t know the real updates of the fellow participants. Later I heard that they were slipping from time to time. A guy damaged his knee which made him slower Sometimes I was asked by fellow participants to reduce my walking pace till the whole group re-unite. At the same time Sun was getting down. View from OG peak toward Gundya.. Its never ending route.. Loved this.. Finally choose a place which was covered with small trees. Better to call it as nature made Fort. In the center there was enough space to take rest. Those trees were very small in height but their stem was thick enough. Looked like Bonsai type. we put up a tarpaulin, and took rest on it. Suddenly it became misty forcing us to assume that it's already dark. It was around 7.00pm. Everyone shared their food. The sumptuous dinner with all sorts of MTR's and a temporary stove. I was looking at the sky. my head was blank. May be I was thinking on” why nothing is in my head”!! :D twinkling stars were trying to show their beauty with the help of wind which was blowing the mist aside. When they finished their food, I picked mine. Ate quickly. Most of people pulled their sleeping bags out of backpacks and prepared to sleep. Even I was shown the symptoms of tiredness by my body. Pulled sleeping bag and fell asleep. At or around 11pm, it started to rain heavily. I didn’t care. Just insert myself deeply into the sleeping bag. It was a bit waterproof. Others went inside tarpaulin to protect from rain. it rained continuously for nearly an hour. Dunno what happened after that. Woke up at 3.00am. Looked like I had enough sleep. My eyes were not ready to sleep again. Pulled myself out of the sleeping bag, looked at the surrounding area. Nothing was visible beyond 100 meters due to mist. But Moonlight was too powerful to tackle with the mist. I could imagine the mist and somewhat trees nearby.it was a Very beautiful scene… it looked like some trees were dipped in milk, washing themselves with water. Forced myself and slept again. May be I was trying to imagine how the second day will be. Dunno when I fell asleep again. I was awakened up by other participants. Had little breakfast. Packed the things and prepared for the second day. 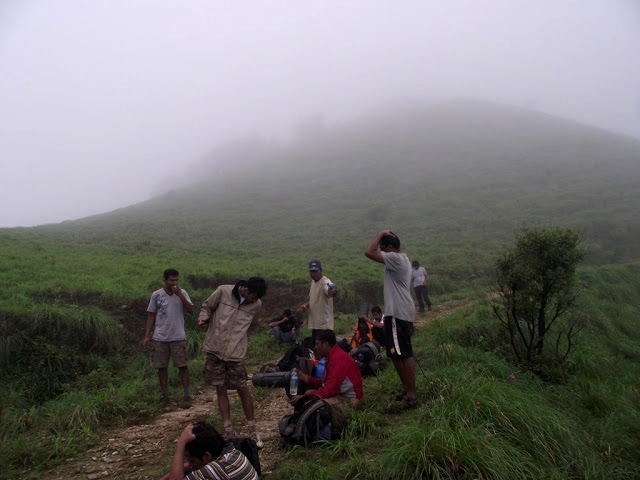 When I looked at the participants, they were in the mood to finish the trek as soon as possible. This morning scene was very different. Came across different locations which was covered with trees on one side, grassland on the other. My eyes were filled with these sceneries. Naveen Alavilli: One of the bravest guys i have ever seen.. Finally thick forest appeared. Before entering, a participant asked how far, how long... I knew the estimated distance. I didn’t want to disappoint him. By showing route map I was telling him if we go till this point then everything will be fine. By the way he responded, He did not seemed to go deeply with the maps. But he was asking me again and again. I was smiling every time he asked. On one side he was trying to create a group inside a group and trying to oppose my decisions and my movements!! Finally he was asking me to go in another direction in place of my predicted route. Dense forests, thorny bushes, slippery slopes.. Especially with morning beauty..
His tantrum increased, decided to let him know how the area will be, how the condition will be. Well, we went in that direction, the forest was with a different kind of look… When we reached the waterfall which was created by the stream (The death of that guy happened in that area, luckily after our trek). The stream was roaring. I couldn’t see the rocks or stones. If they were visible, they were wet and slippery. Was patting myself for not picking that route. Lucky.. I didn't pick that trail this time.. Halted for a moment near Bamboo trees till other participants united us. Ate snacks, may be it was the leftover food we had in our luggage. Everyone were thinking whether to eat it completely or not. Realized that if we delay or if something happens then we have to stay for whole night in that place without food. Decided to move quickly as much as possible. We waited till everyone reached the point and took enough rest. Within few meters, Kabbinaale stream appeared which is the biggest of all in terms of width. Was inspecting whether it is good to cross in such level. At the same time it started to rain. Remembered Mudassar’s advice. Don’t cross the stream when it’s raining. His words were 100 percent right. Minute by minute the level was increasing. Reached the peak. Was really difficult to imagine the level. At the same time I was enjoying Mother nature’s beauty. If we hadn’t diverted the route , we would have saved nearly 30-45 minutes which was enough to cross the stream before it started to rain. Moreover there were some less experienced trekkers who lost the faith once they saw that ROARING big stream. They sat on the bank with blanked feelings... They started collecting wood to spend the night on the bank of the river. I swear, the situation was really dangerous.. Even I could hear the roaring sound of the stream. I wanted other participants to be safe. We tried another two times in different locations. Finally my friend told it’s really difficult to cross. Even I knew the same. He thought of skipping the trail for that day. After struggling for nearly 4-5 hours, to our luck water level of the stream got down. it was pitch dark when everyone reached the other side of the stream. It was 7.00pm. No one was in the state to pull their camera out into action… Head torches, hand torches were switched on. it was really very late to reach the end point of the trek. If we delay then it would be very hard to catch the bus. I was walking in fast pace. But my fellow trekkers... they were asking me to slow down. After struggling for nearly three hours everyone were able to reach the nearby village which was the end point of the trek. I sat in front of a house, checking the left out leaches all over my body till the remaining trekkers arrived. In this write-up I give less importance to leaches since writing on leaches will lead to another story. At 10.00pm(22.00pm), the last person reached the point. We were in a jolly mood. My mind was in elated state. I informed a trekker to call Kukke KSRTC control room to inform them about catching the bus in Gundya instead in Kukke town.The advantage was, every bus will pass through Gundya. But because of the poor network we couldn't contact them. To our luck we were able to catch a bus till Gundya. Once reached, we were inspecting the bus where our tickets were reserved like how RTO people do. Finally a bus arrived which was ours. Some of our seats were filled by the conductor to make more money!! But we were in the state of getting any seat to get back to Bangalore. [L-R(standing)] James, Naveen, Aseem, Tejaswi, Madhu Ramalingam, Shashidhar, Madhu bagur, [L-R (sitting)] Sunil, Ashish, Nitin, Srikanth.